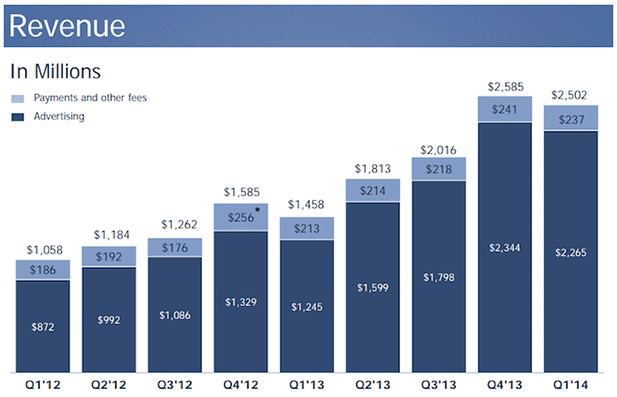 Facebook yesterday announced its financial results for the quarter ended March 31 2014. The results are great but pale in comparison to Apple’s $45.6 Billion revenues in the same period. “Facebook’s business is strong and growing, and this quarter was a great start to 2014,” said Mark Zuckerberg, Facebook founder and CEO. “We’ve made some long term bets on the future while staying focused on executing and improving our core products and business. We’re in great position to continue making progress towards our mission. 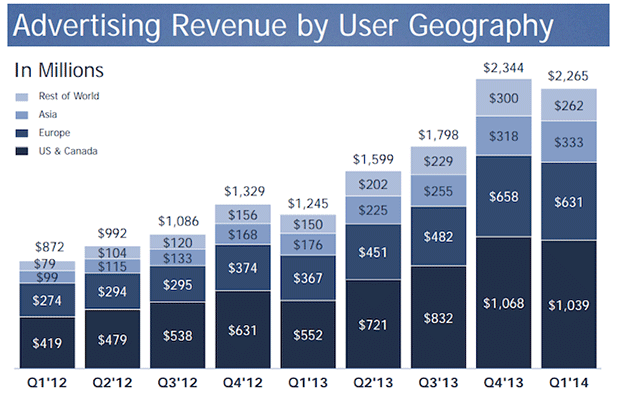 Facebook has realised growth in both revenues and user stats throughout the world. Revenue for the first quarter of 2014 totaled $2.50 billion, an increase of 72%, compared with $1.46 billion in the first quarter of 2013. Adverting revenues accounts for 90.8% of total revenue, representing an 82% increase from the same period last year. 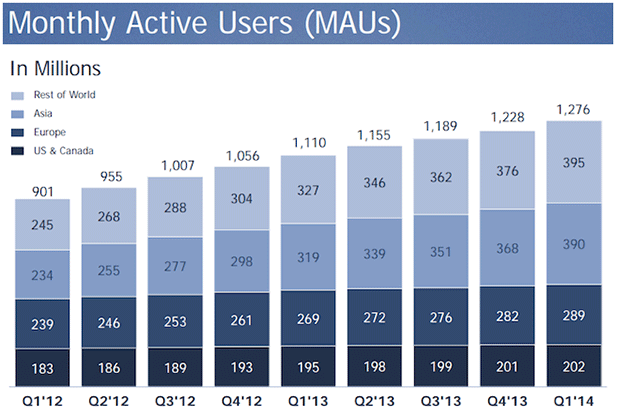 The Daily Active Users are more impressive at 802 million. This is also represents a whooping 21% increase from the same period in 2013. 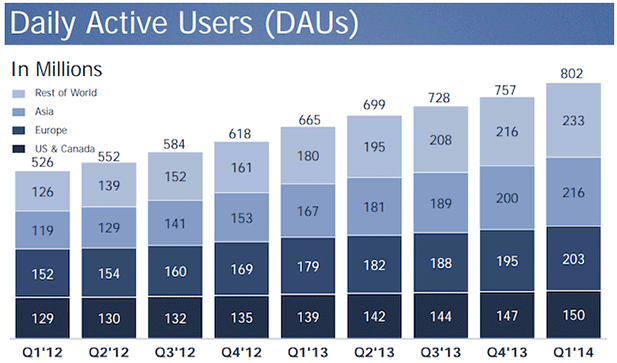 It’s not a surprise that 75% of the DAUs are mobile users underlining Facebook’s focus on mobile over the preceding period. 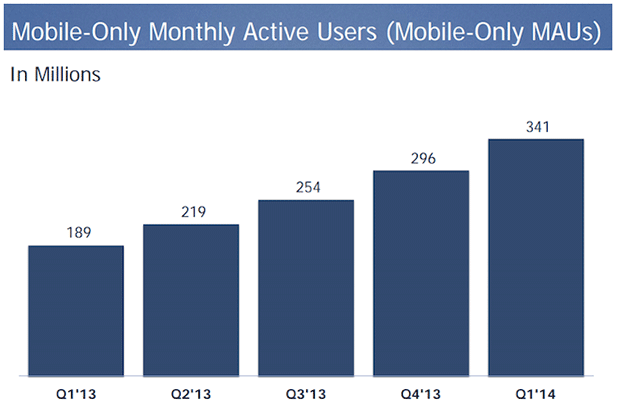 Here are a few graphs from Inside Facebook on Facebook’s Q1 2014. You can download the full results here.